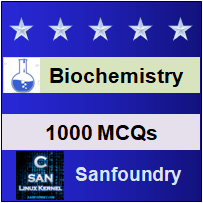 This set of Biochemistry Multiple Choice Questions & Answers (MCQs) focuses on “Analysis of Metabolic Control”. Explanation: Flux control coefficient relatively measures of how much a perturbation affects a system variable flux. 2. What is the relation between elasticity coefficient, flux coefficient and response coefficient? Explanation: R = C.ε, where R=response coefficient, C = flux coefficient and ε=elasticity coefficient. 3. Which of the following is a measure of the effect of an enzyme’s concentration on flux through a multi-enzyme pathway? Explanation: Elasticity coefficient is a measure of how responsive the enzyme is to changes in the concentration of a metabolite. An expression for the experimentally determined change in flux through a pathway in response to a regulatory hormone or second messenger is response coefficient. 4. Which of the following is a measure of how responsive the enzyme is to changes in the concentration of a metabolite? Explanation: Flux control coefficient is a measure of the effect of an enzyme’s concentration on flux through a multi-enzyme pathway. Elasticity coefficient is a measure of how responsive the enzyme is to changes in the concentration of a metabolite. 6. Which of the following statements about the control of glycogen synthesis from blood glucose in myocytes is incorrect? Explanation: The change in glycogen synthase activity decreases the flux towards glycogen. Explanation: Some regulated enzymes control the flux through a pathway, this activity is control. Explanation: Some regulated enzymes rebalance the level of metabolites in response to the change in flux, this activity is regulation. Explanation: When the blood glucose level rises, insulin acts in muscle to induce the synthesis of hexokinase. 10. Which of the following is the most influential in setting the flux through glycolysis? Explanation: The real role of PFK-1 regulation is not to control flux through glycolysis but to mediate metabolite homeostasis.